Moms and dads need all the help they can get. Why not let technology make your life a little bit easier? That’s just what this high tech baby gear is designed to do! We’re all about using technology to improve our quality of life, which is why we’re always on the lookout for cool baby gadgets to make things easier. Plus, if you pick up a couple of these baby products you can be the hip parent on the block who has the latest gear and gadgets everyone envies. 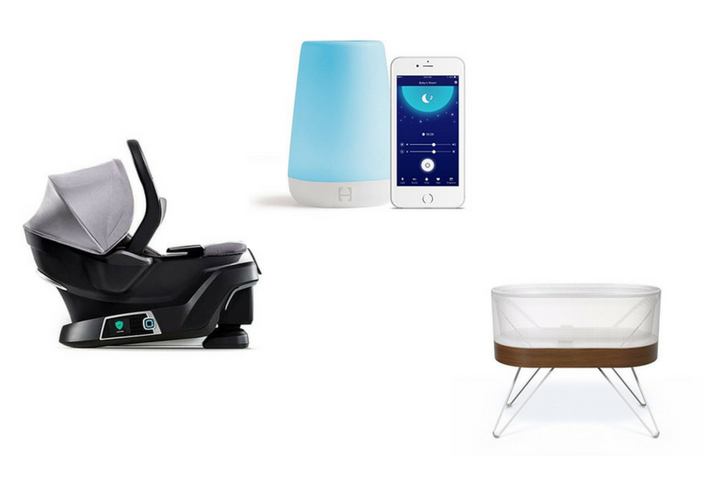 So check out our list of the top high tech baby gear. We bet you’ll find something you new you have to add to your parenting arsenal! 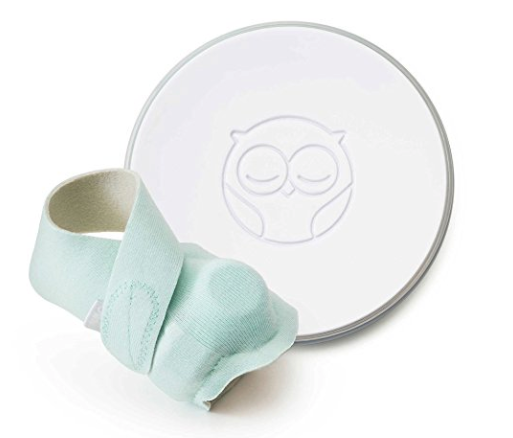 The Owlet Smart Sock is a home version of hospital technology that monitors oxygen levels while babies sleep, but in super cute sock form. This high tech baby monitor also tracks heart rate, skin temperature, and rollovers, then sends all that data directly to your phone. No service? The Smart Sock sends this information to a base station which is designed to notify you with lights and sounds if something appears to be wrong. This is great for parents who are concerned about their newborn’s O2-levels. It works for infants from 0-18 months. Using Owlet’s app, you can view real-time wellness data and receive direct notifications on your phone. Night terrors, which occur when preschoolers and toddlers fall into a deeper than normal sleep, can be terrifying for parents too! They’re like nightmares, only way more physically violent. 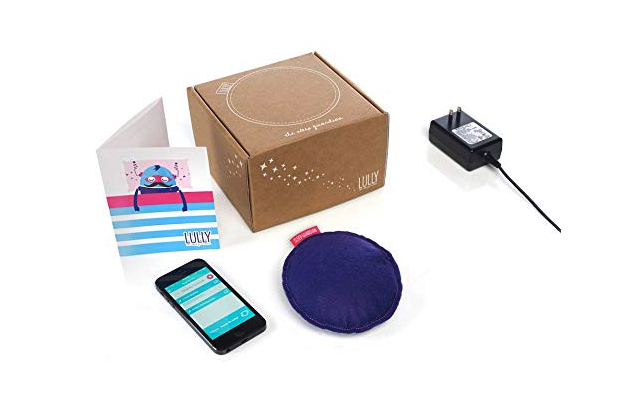 The Lully Sleep Guardian learns your kid’s sleep pattern, and then stimulates them with gentle vibrations at specific times to keep them at a healthy depth of sleep all night. This baby sleep gadget has been clinically proven to work, which is music to the ears of freaked out parents everywhere. Scientific research has shown the many benefits of speaking to your baby from the time they are a newborn. How do you know if you’re talking “enough”? The Starling is a device that counts your words (without recording), and gives you a daily word count. It also provides tips and activities to keep you talking, thus ensuring your baby gets the sensory input they need. The clip attaches easily to a baby’s clothing and stays put. It’s also waterproof, drool-proof and drop-proof – which is essential for something your baby is going to wear! 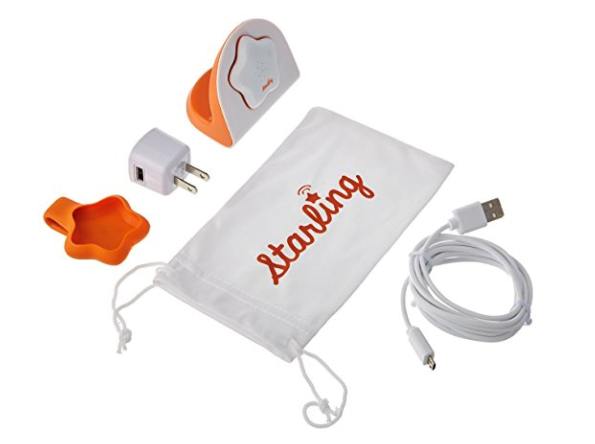 The Starling pairs through Bluetooth with a fun, easy-to-use app for iPhone or Android. Nanit is a high-def, night-vision video monitor that live streams your baby sleeping (or wiggling) directly to your smartphone using local Wi-Fi or mobile Internet. 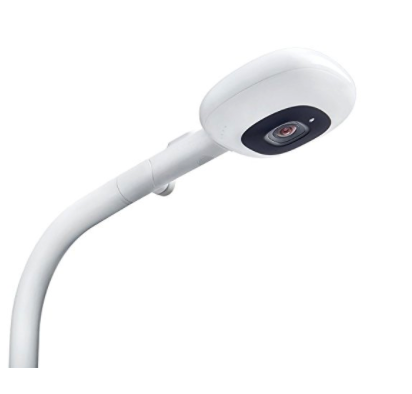 With this high tech baby monitor you can see and hear your baby 24/7 and zoom in to get in close. Nanit also takes the temperature/humidity in the room, and provides one-way audio so you can listen in. The device will send you smart notifications if your baby wakes, cries, or stirs. The coolest feature for all you tech-nerds is the camera’s “computer vision,” which monitors how your baby sleeps, noting total sleep time, wake time, and the number of times you come in the room. The Nanit takes all that data, crunches the numbers using an algorithm, and sends a report you can scan in the morning on the app. If all that weren’t enough, Nanit includes a Soft Glow Night Light so you can find pacifiers in the dark without waking baby. Hatch Baby Grow is the second generation (and more affordable!) Smart Changing Pad from Hatch Baby. 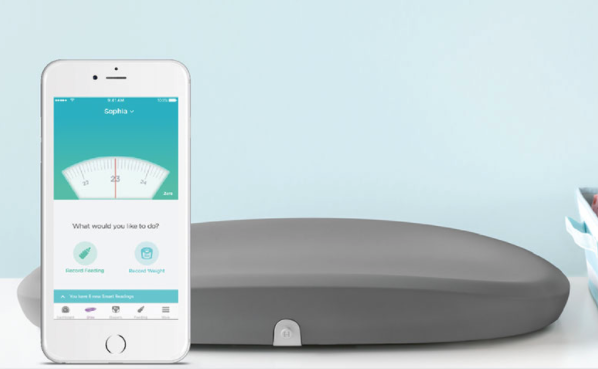 It combines a traditional diaper changing pad with a built-in, wireless smart scale so you can easily track infant health metrics including weight, intake during feedings, diapers, length, and sleep. Related: Must Have Breastfeeding Products That Make Life Easier! The most important job of a car seat is to keep your kids safe when you’re driving, but what if it could do more than that? 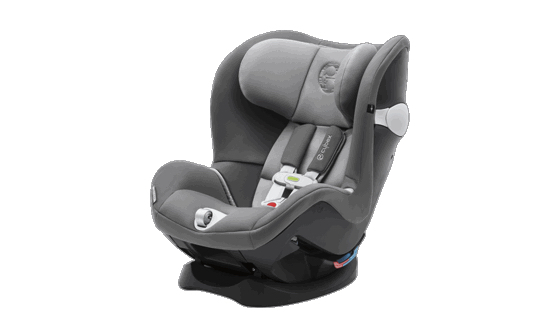 The new Cybex Sirona M Car Seat can prevent your kids from being left in the car accidentally, make sure they aren’t overheated, and more! What makes this new car seat so special is its built-in monitoring app. The system, which syncs with your smartphone, can monitor your kid’s temperature, time spent in the seat, and even whether or not the harness is on correctly. The app will alert you if your kids have been in the seat for more than two hours and if their body temperature becomes elevated. Together these notifications can help prevent kids from being forgotten in the back seat. The car seat is a convertible, so you can begin using it immediately with the infant insert and it will carry you through toddlerhood, with a max weight of 65 pounds. This bed was developed by Dr. Harvey Karp, you know the Happiest Baby On The Block book author. So this thing just HAS to be good. The Snoo Smart Sleeper uses three integrated microphones to monitor your baby’s crying and soothe them back to sleep with an optimal mix of white noise and vibration. Don’t you wish you had an adult sized version of this thing? Dr. Karp created his 5 S’s method to calm a fussy baby (swaddling, shushing, swinging, sucking, and side position). 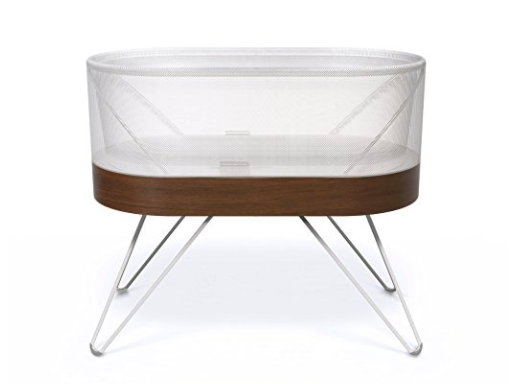 This bassinet automates that process and helps boost a baby’s sleep. It automatically selects the type of noise (soft rain, heartbeats, etc.) and volume level, as well as the type of motion and speed, based entirely on how agitated or relaxed your child sounds. Freaking genius! Top top it all off, the Snoo Sleeper has a unique 5-second swaddle to keep babies safely on their back while in the bassinet. 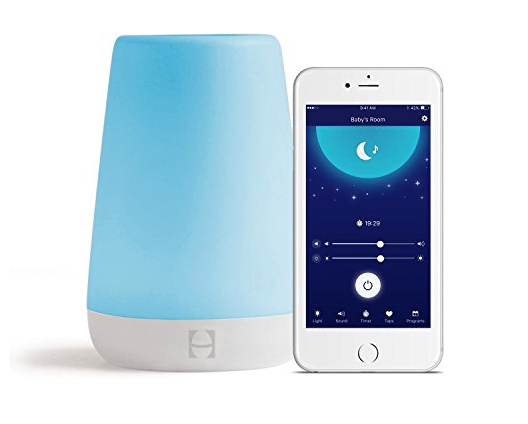 Encourage a better night’s sleep for your baby, toddler or big kid with this cool Hatch Baby night light that allows you to customize hues, brightness and sounds, and save them as favorites for future use. Set and control programs from the device or remotely from your phone, no need to disrupt a sleeping baby. Rest can also be programmed to turn on automatically, or you can do it manually. This is truly a magic lamp! 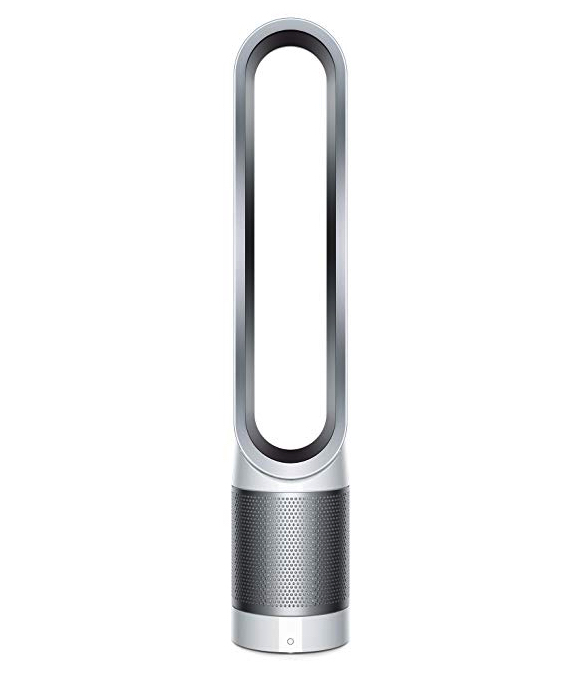 The Dyson Pure Cool Link is an oscillating, bladeless fan that not only keeps the nursery at the proper temperature, but automatically measures a room’s air quality and removes any allergens and pollutants it finds. Talk about high tech gear for baby! The fan’s filtration system is said to trap 99.97 percent of .3 micron small germs and particulates (including mold, bacteria, pollen, and pet dander), but also gasses like Formaldehyde and Benzene. You feel safer already, don’t you? The fan syncs to a smartphone app where you can schedule air purifying, set sleep timers, and even put it into a quieter, nursery mode. 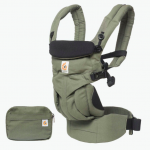 Related: Must Have Baby Items For New Parents! SHARE this cool high tech baby gear on Facebook and Pinterest by clicking the buttons below.